Didn't want to be seen at African Cup of Nations qualifier. A fan hid after spotting herself on the big screen at the FNB Stadium during South Africa’s 1-1 draw with Nigeria on Saturday. 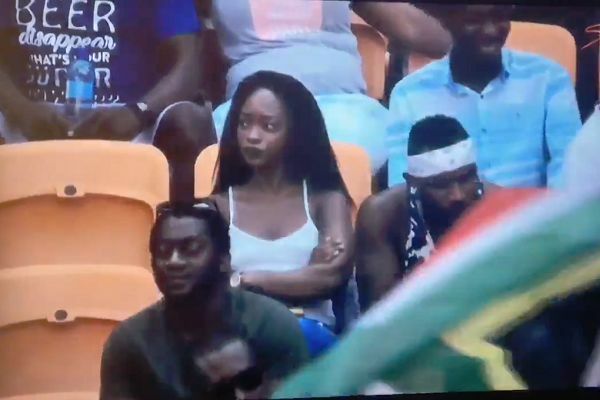 Seeing herself popping up in the coverage of the Africa Cup of Nations qualifying match at the home ground of Kaizer Chiefs FC, she suddenly ducks for cover. Her lunge for obscurity seems to take her friend by surprise, judging by his alarmed reaction having previously been sat idly gazing at his phone. An own goal from defensive midfielder Lindokuhle Mkhwanazi gave the visiting Super Eagles a lead in the 9th minute. Lebo Mothiba then equalised for Bafana Bafana midway through the first half, converting man of the match Percy Tau’s pass to score his fourth goal in five international games. The result ensures that Nigeria have qualified for next year’s tournament in Cameroon, while South Africa just need to avoid defeat against Libya to do so.